We had a nice Easter dinner at Grandma and Grandpa Jackson's house on Easter Sunday. Lucy got into the Easter Egg hunt in the backyard once we showed her the ropes and she caught on. Her big surprise was waiting for her at the top of the stairs (in the backyard)...but she was more interested in the swing than the actual stuffed bunny and bag of candy. Hey, if she goes for fun and exercise over candy and toys, that's a good thing. It was great to hang with Peggy, go on a walk, and enjoy our own Easter baskets created by Marleney. Thanks a million! Lucy enjoyed a non-traditional Easter Egg hung Saturday morning with Nana and Poppa Bice at the West Jordan Aquatic Center. She got to "dive" for her eggs in the pool and she loved it! She's become quite the swimmer. We had an absolute ball swimming together for about 2 hours. Now that she knows what a mermaid is (thanks to the mermaids in Peter Pan) she loves to pretend to be one (especially in the bath). We think this helped her get over some of her fears in the pool. She was being quite the "mermaid" and jumping into the pool, going down the water slide with Mommy, and riding on daddy's back around the lazy river. Cousins Bailey and Jayda were there as well and she loved looking at the baby and splashing around with Bailey. Poppa Bice needs to email us the photos so we can post them! Nana made a DELICIOUS prime rib dinner with her garlic mashed potatoes and asparagus. To die for. After dinner, we headed downtown so Vic could get a haircut. Lucy slept soundly in the car all the while. We weren't ready to head back to the snow in Park City, so we took a nice Saturday afternoon drive through the Avenues. We would love to live in that neighborhood. We'll figure out what we're going to do with our housing situation eventually! 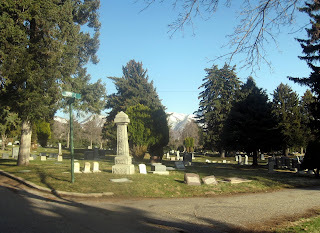 Anyway, we enjoyed the views and the fresh Spring air while we drove and eventually ended up in the cemetery where Pres. Hinkley is buried. We found it quite appropriate to be in a cemetery on Easter weekend and enjoyed a discussion about the Resurrection. 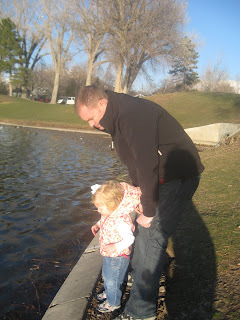 When Lucy awoke we headed to Liberty Park to feed the ducks and go on a walk. 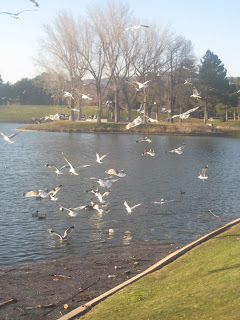 It was too nippy and windy to walk, but we enjoyed throwing bread at the "quack quacks" and watching the hundreds of seagulls fly around like lunatics. It was a great Saturday. I sang in the branch on Sunday (two verses in Spanish, two in English). "I Know That my Redeemer Lives". I think it went OK. I am going in reverse order here, but I must mention that we had another Easter celebration with the Spanish Branch on Friday night. Vic and I were in charge of the games and activities. We had an egg dyeing contest, played relay games, and got a sugar high from all the candy. Lucy was in heaven. It's a whopping 52 degrees right now and maybe we'll see grass within the next three weeks! Happy Easter and bring on the Spring! I do love her Easter dress. Really, she has to be one of the best dressed kids around!!! Is that a bathtub picture of Vic? Sheesh Molly, isn't he a little old for that??? LOVE that dress! Sounds like you had a great weekend. 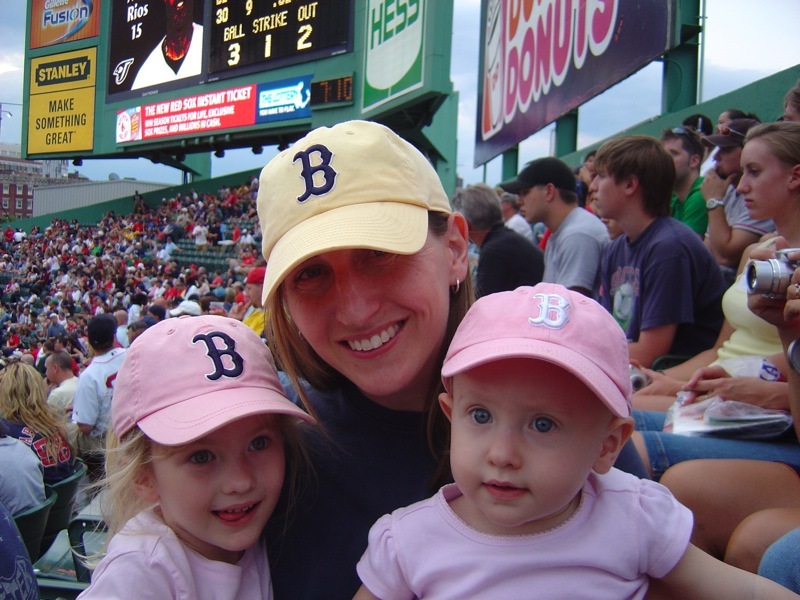 Looking at the pic of Peg and Vic, no one (who doesn't know them) would ever guess they're related. Seriously, how did those two come from the same family? Anyway, I love polka dots, so I just love Lucy's dress. It was fun talking to you guys on the web cam. Besides blogs, it makes it seem like less distance between us all. And 51 degrees? I remember when that used to be like sun-bathing weather. Not so much anymore. Brrr. Cute pics! 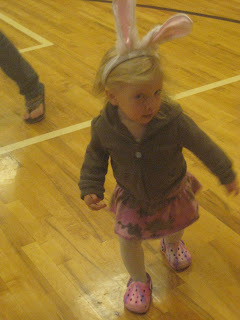 I love her listtle Easter dress. Lucy is so freaking adorable!! Girls have the cutest options for dresses and clothing in general. It was a struggle to find something for Roy to wear. I saw your friend as Nessarose in Wicked and she has been to church once since we have been here, but I don't think I know the Newtons. Do you know what ward they are in? I hope all is well!! Great dress little Lucy. You take after your mom in taste and fashion sense. You're both beautiful all the time. Grace says your pictures of Easter are too fun. So fun. Happy Easter! What a fun weekend! You guys are all so beautiful. Hey I tried to call you last night. Call didn't go threw though.